Are you interested in having Jennifer speak at your next corporate event, symposium, or wellness day? 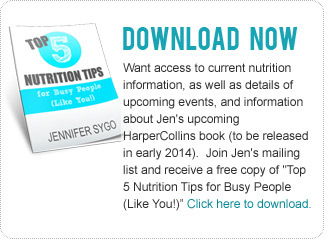 Would you like Jennifer to bring her nutrition expertise to your sports team or organization? Then you've come to the right place! Please complete the form below, and we'll get back to you as soon as possible. Jennifer provides one-on-one nutrition nutrition coaching and sport nutrition counselling during regular business hours at Cleveland Clinic Canada, conveniently located steps from Union Station and the Hockey Hall of Fame in downtown Toronto. To book or change an appointment, please contact Patient Service Representative, Sharon Pierre at pierres2@ccf.org, or 416-507-6756. I wanted to let you know how appreciative the group was for your candid approach to eating well. Jennifer your knowledge and experience are evident in the way your present. It was noted that your style and delivery were so well received. That, by the way, is not common! You have a gift. You came across as a sincere expert in a field which is constantly evolving. Thanks for sharing."